November-April is the official cyclone season in Madagascar, just in case you were wondering. Apparently there was a tropical storm that hit the southeastern part of the island last Wednesday. 36 people have died and thousands more have been affected. Mudslides have taken out roads that has slowed and cut off emergency aid to parts of the country. Not sure if Fort Dauphin was hit or not but I haven't heard anything from Azafady, so maybe no news is good news. 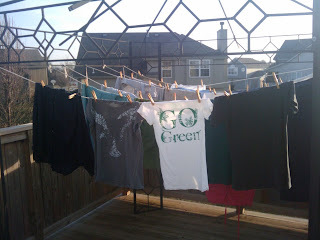 The sun finally decided to join us in Kansas City today and I took full advantage of the 64 degree weather to treat my clothes with the insecticide. I went through most of the two bottles, I think 1 liter apiece. I have enough left over for a pair of jeans and anything else I have room to throw in at the last minute. After treating you have to air clothes for two hours. Seeing as it is supposed to snow this weekend I hurried to get them all treated before the sun went down.